When asked to provide some insight into the personality behind this old face, Tom had to pause. His lifelong dedication to landscape design and construction came from a deep-seated desire to touch and work with the earth. “I wanted to avoid slipping on a neck tie and reporting to work in a climate-controlled office. Pre-Forestry classes led to Horticulture training at The Ohio State University”. Originally from Youngstown, Ohio, he was given a plane ticket to Seattle by his father upon his graduation. “As one of five children, I think that was my Dad’s idea of a gentle push from the nest”. He explained that his Dad’s advice was based on his experience delivering planes from Boeing Field when he was a young man during WWII. 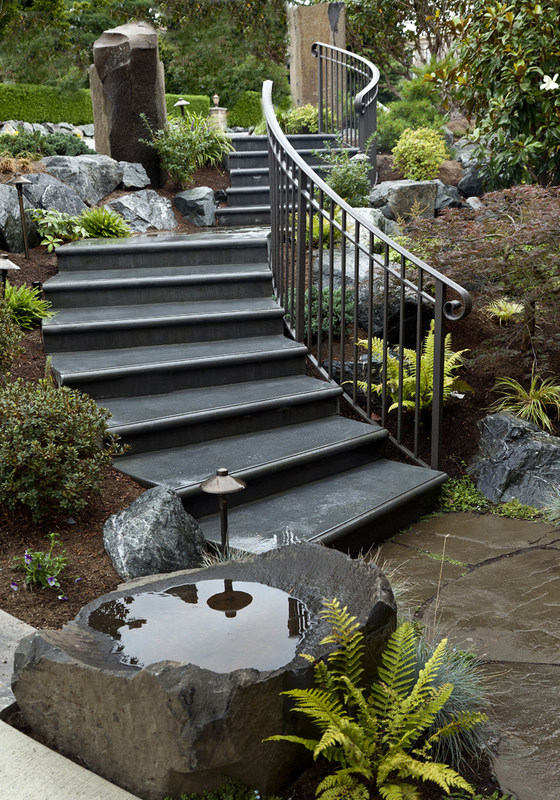 Tom’s West Coast love affair with landscape design and construction began back in 1979, when he moved here permanently. 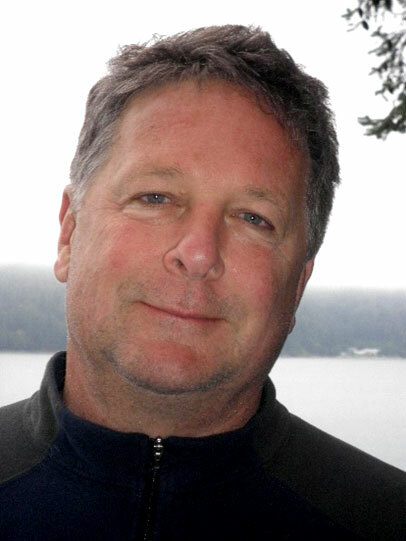 Over the subsequent 39 years, Tom’s career has grown focusing primarily as a construction foreman for several local companies, to a designer and builder of fine gardens in the greater Seattle area. He has been self-employed since 1982 and has been the leader of Environmental Construction, Inc. since starting the business in 1990. After a long career as the sole owner of his company, Tom fulfilled a lifelong desire when Environmental Construction, Inc. officially became an employee-owned business in December 2017. He is proud to welcome Lori Beehner and Jon Daughtry as shareholders. Tom says “It was time to acknowledge the role these others have played in my success”. “In spite of being instructed to write about myself for this opportunity, there is no getting around that I now enjoy the combined talents of an extended team as part of my sense of who I am”. ECI’s network of in-house and outside skilled tradespeople includes designers, engineers, concrete, carpentry, masonry, electrical and plumbing tradespeople, plus amazing Horticulturists with expertise as color and plant specialists. Tom says “I want to recognize and salute the other APLD designers who provide beautiful and professional CAD drawings and building permit services as independent members of our team. Joining APLD has been an amazing opportunity to re-immerse myself in a remarkable pool of green industry professionals. They remind me daily of why I love this business”. Tom’s favorite part of the business is meeting and working with people. And while he enjoys spreading his wings during the dreaming phase (at initial consultations), he admits that at some point, his dreams and the client’s fiscal realities must balance. As for the future, Tom laughs when he says, “I will enjoy watching Lori and Jon take over the business as I waltz into the sunset in another 7 to 10 years … or maybe never!” Tom joined APLD back in 2011 and has served on the Washington Chapter Board since 2015. 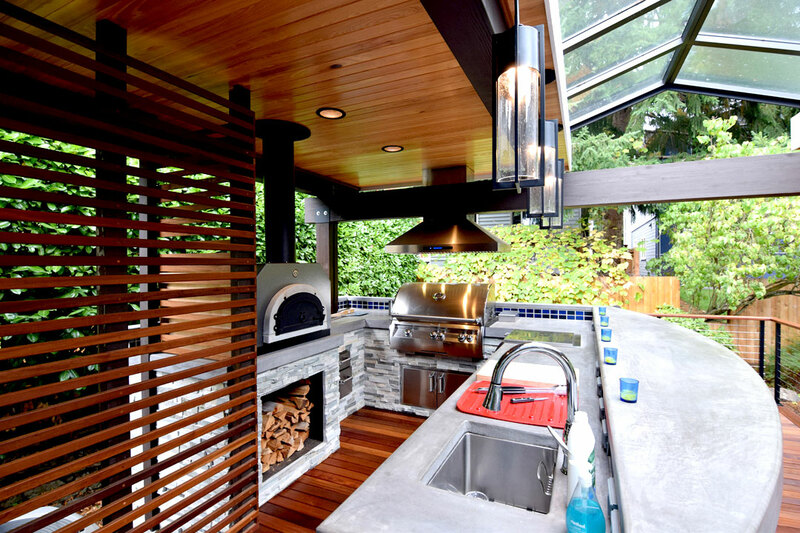 Our client in Seattle had a small back yard deck that they wanted to remove and replace with an underground wood shop and outdoor kitchen above. We removed the deck and dug out the required "basement" hole where the shop would go, and poured the new foundation walls and framed above with a water-proof deck. 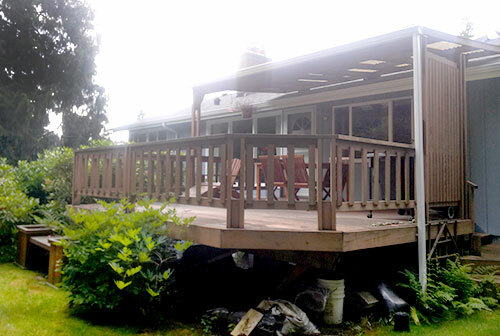 We framed over the waterproof deck, and installed the glue laminated beams, roof and cabinets. The finish product exceeded our client’s expectations. 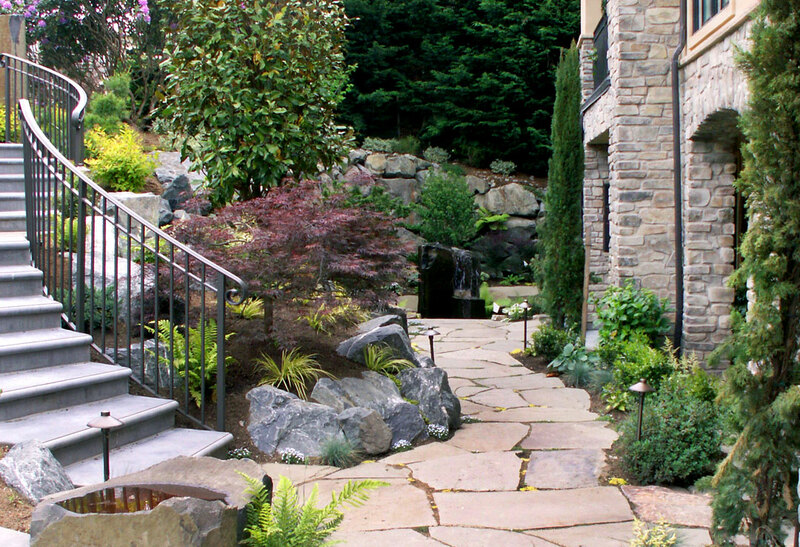 This project was a Washington Association of Landscape Professionals (WALP) Grand Award ‘Unique Project’ winner in 2015. 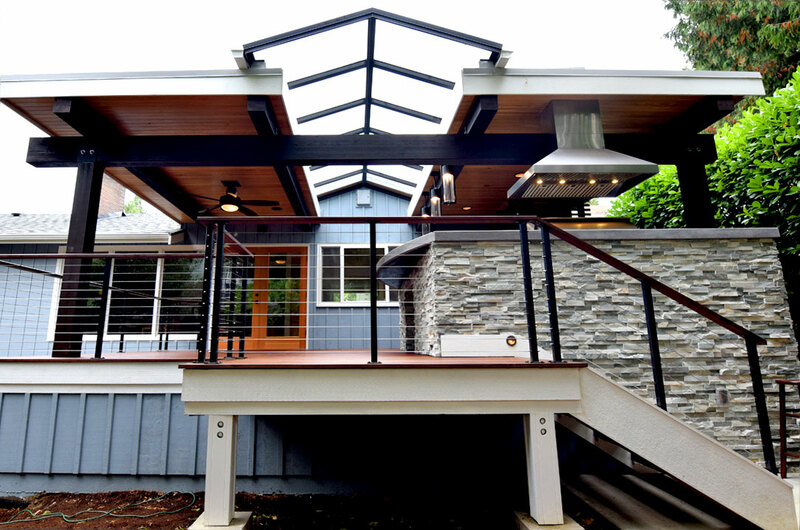 When we met this Kirkland home owner she had to walk down her steep driveway to access her front entry walk. 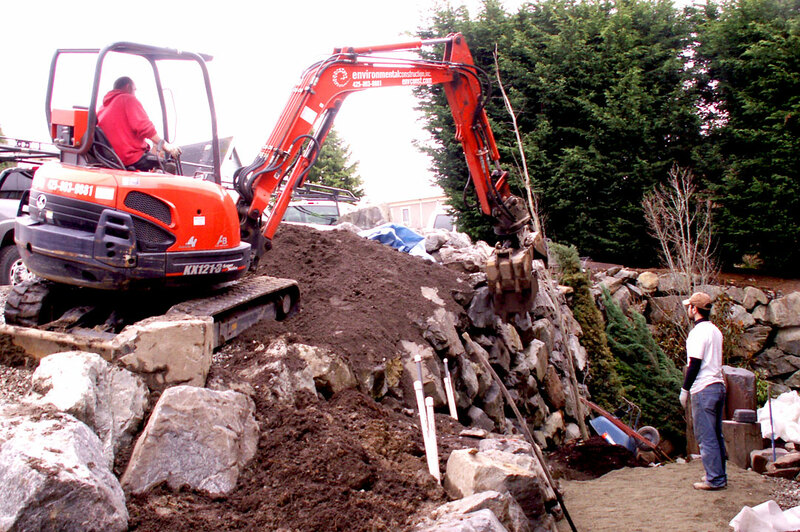 This project involved splitting an eight-foot tall vertical rockery and re-setting the rock from the top into an outcropping farther below and over-filling the bottom of the original rockery. 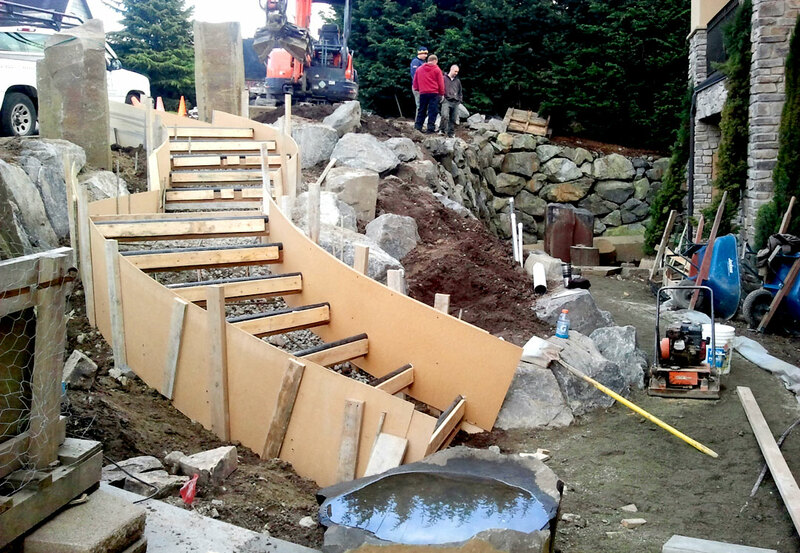 We were then able to form and pour the new serpentine steps from the street to the new front entry walk. After that it was a matter of raising the new entry walk by walling up from their existing front entry with Eagle Mountain rubble, adding the large size Pennsylvania Bluestone path and adding step railings and finishing touches. The client’s new front entry through her garden was more functional and far more inviting. This project was also a WALP Grand Award ‘Residential Construction’ winner in 2012.